Born in London on January 24, 1540, Campion received his early education at Christ's Hospital, and, as the best of the London scholars, was chosen in their name to make the complimentary speech when Queen Mary visited the city. He then attended Oxford, where he became fellow of St John's College in 1557 and took the oath of supremacy on the occasion of his degree in 1564. When Sir Thomas White, the founder of the college, was buried in 1564, the Latin oration fell to the lot of Campion. Two years later he welcomed Queen Elizabeth to the university, and won her lasting regard. He was chosen amongst the scholars to lead a public debate in front of the queen. By the time the Queen had left Oxford, Campion had earned the patronage of the powerful William Cecil and also the Earl of Leicester, tipped by some to be future husband of the young Queen. People were now talking of Campion in terms of being a future Archbishop of Canterbury, in the newly established Anglican Church. Religious difficulties now arose; but at the persuasion of Richard Cheyney, Bishop of Gloucester, although holding Catholic doctrines, he received deacon's orders in the Anglican Church. Inwardly "he took a remorse of conscience and detestation of mind." Rumours of his opinions began to spread and he left Oxford in 1569 and went to Ireland to take part in a proposed establishment of the University of Dublin. Campion was appointed tutor to Richard Stanihurst, son of the Speaker of the Irish parliament, and attended the first session of the House of Commons, which included the prorogation. He lived as part of the Stanihurst household in Dublin and had conversation with the Speaker daily at table. Campion was transferred by Stanihurst's arrangement to the house of Patrick Barnewall at Turvey in the Pale, which he acknowledged saved him from arrest and torture by the Protestant party at Dublin. For some three months he eluded his pursuers, going by the name Mr. Patrick and occupying himself by writing a history of Ireland. In 1571, Campion left Ireland in secret and escaped to Douai in the Low Countries (now France) where he was reconciled to the Catholic Church and received the Eucharist that he had denied himself for the last 12 years. He entered the English College founded by William Allen, another Oxford religious refugee. The College's intake grew dramatically and a little after Campion's arrival a papal subsidy was granted. The object of the college was primarily to supply priests for the Catholic population in England, as all of the bishops were now either dead, exiled or under detention and thus impeded from ordaining new priests. The Queen's principal secretary, Sir William Cecil, expected that in a few years time the 'Marian Priests', ordained under the reign of Elizabeth's predecessor, would begin to die out, and the old faith would disappear with them. It was also a centre of intellectual excellence. Here the famous Douai Bible was produced, in advance of the King James Version. Campion found he was reunited with many of his old Oxford friends. He was to teach rhetoric whilst there and finish studying for the degree of Bachelor of Divinity, granted him by the University of Douai on January 21, 1573. However Douai was more than just a seminary, and became a rallying point for exiled English Catholics and important political visitors were reported to come to see Cardinal Allen under cover of darkness. As a result, the English government was soon sending spies to find out about the institution, some of which feigned conversion to Catholicism or even became priests. Having obtained his degree, Campion decided to answer a growing call within him and left for Rome, travelling on foot and alone in the guise of a poor pilgrim. In that same year he entered the novitiate of the Jesuits, and was to spend some years at Vienna and Prague. In 1580, the Jesuit mission to England began. Campion accompanied Robert Persons who, as superior, was intended to counterbalance his own fervour and impetuous zeal. He had been reluctant to follow the father general's order to take part in the mission, the members of which were instructed to avoid the company of boys and women, and to avoid giving the impression of being legacy hunters. Before embarking, the members of the mission were embarrassed to receive news of a landing by papal sponsored forces in the Irish province of Munster in support of the Irish rebel James Fitzmaurice Fitzgerald. They also learned that a letter detailing their party and mission had been intercepted and that they were expected in England. Campion finally entered England in the guise of a jewel merchant. He arrived in London on June 24, 1580, and at once began to preach. His presence became known to the authorities, and the diffusion of the challenge he threw down in the form of a declaration, known as the "Challenge to the Privy Council" to his allies and as "Campion's Brag" to his enemies (by which name it is most commonly known today), made his position more difficult. He led a hunted life, preaching and ministering to Catholics in Berkshire, Oxfordshire, Northamptonshire, and Lancashire. During this time he was writing his Decem Rationes ("Ten Reasons"), a rhetorical display of reasons against the Anglican Church. The book was printed in a clandestine press at Stonor Park, Henley, and 400 copies were found on the benches of St Mary's, Oxford, at the Commencement, on June 27, 1581. The sensation was immense, and the hunt for Campion was stepped up. On his way to Norfolk, he stopped at Lyford in Berkshire, where he preached on July 14 and the following day, by popular request. Here, he was captured by a spy and taken to London with his arms pinioned and bearing on his hat a paper with the inscription, "Campion, the Seditious Jesuit"
Committed to the Tower of London, he was questioned in the presence of Elizabeth, who asked him if he acknowledged her to be the true Queen of England. He replied in the affirmative, and she offered him wealth and dignities, but on conditions which his conscience could not allow. (To reject his Catholic faith.) He was kept a long time in prison, twice racked (by order of the Council but certainly with Elizabeth's consent), and every effort was made to shake his constancy. Despite the effect of a false rumour of retraction and a forged confession, his adversaries in despair summoned him to four public conferences (September 1, 18, 23 and 27, 1581). Although still suffering from his treatment, and allowed neither time nor books for preparation, he bore himself so easily and readily that he won the admiration of most of the audience. Tortured again on October 31, he was indicted at Westminster on a charge of having conspired, along with others, at Rome and Reims to raise sedition in the realm and dethrone the Queen. 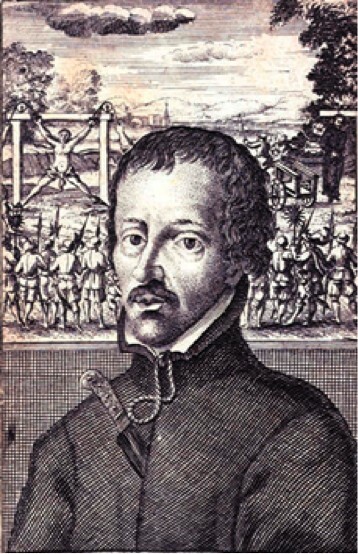 He answered the sentence of the traitor's death with the Te Deum laudamus, and, after spending his last days in prayer, was led with two companions to Tyburn and hanged, drawn and quartered on December 1, 1581. This information has been taken in part from the Wikipedia Encyclopedia under the terms of the GNU Free Documentation License.